The project tells patient stories via paintings by artist Regina Holliday. This is the seventh year of the Walking Gallery of Healthcare. 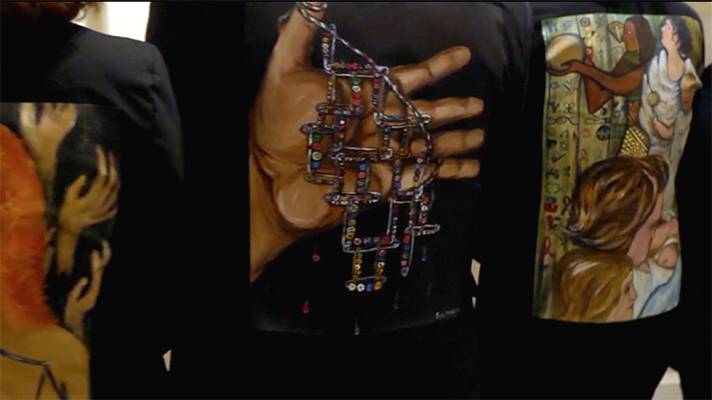 We now number 432 members walking around the world with patient story paintings on our backs. We are attending medical conferences where often there isn’t a patient speaker on the dais or in the audience. We are providing a patient voice, and by doing so, we are changing the conversation. An artist interviews medical professionals and individuals to form a patient centric narrative. The artist then creates representational imagery and paints that picture story onto a business jacket of the provider of the narrative. The provider of the patient story aka “the walker” wears the jacket to medical conferences and events in order to disseminate the patient story to a large group of policy-minded attendees and to represent the individual patient voice in venues where they are underrepresented. Both the artist and the walker support the spreading story and image via social media. As of July 2017, 432 walkers have joined the gallery wearing 476 jackets. The Gallery has representatives on six continents, but the majority of walkers reside in the U.S. One artist creates the majority of the art, but new artists are frequently joining the movement. The Gallery is promoted heavily on Twitter, Facebook and personal blogs. Its widening appeal within the health conference community is creating a new space for patients at such events.